The Riddler holds the esteemed Peregrinator Club hostage during its annual Father and Son Christmas party. He claims he knows the secret identities of Batman and Robin, and that they are likely to be members in attendance. The Riddler and his hench gals drag in Summer Gleeson to represent the media as he accuses various members. Meanwhile, Robin ponders the lack of riddles as he and Batman travel to the club. “There’s always a riddle,” Batman says. Upon arriving, the dynamic duo finds a robbery underway in the club’s vaults. Realizing the “show” in the main hall is a distraction from the robbery and real riddle, Batman and Robin confront Riddler, only to see him escape after he ignites exploding Christmas trees. Riddler slips away in the guise of a SWAT team officer, but Batman and Robin chase him down in the stolen police van. An epilogue follows in which Bruce honors the memory of his father, who was a member of the Peregrinator Club. Good Riddler stories are hard to find. Crafting appropriate riddles can be tough, and riddles within riddles are even harder. And then there’s the whole “why does he do it?” aspect of the Riddler. I’m pleased to say this story by Dini is a solid Riddler tale. To me, the best Riddler stories feature riddles in the background, rather than the forefront of the story, and that’s the case here. And as a whole, the story felt like an animated episode script adapted for comics. That’s a good sign. In the story, Riddler has two hench gals named Quiz and Query. In the main DC universe (whatever that is these days), his hench gals are/were two white ladies named Query and Echo. In this case, Quiz and Query are African-American. The change in names and ethnicity doesn’t bother me. I simply find the change interesting. As of this writing, I can’t recall if Riddler’s hench gals show up in the animated comics again. I know they were never in the show. Templeton and Burchett deliver animated-style goodness once more! I love the fact I could recognize Riddler under the SWAT helmet by the shape of his nose. That’s a testament to the art. This story could easily have taken place anytime before “Riddler’s Reform,” and perhaps even after. It’s pretty timeless. Yes! 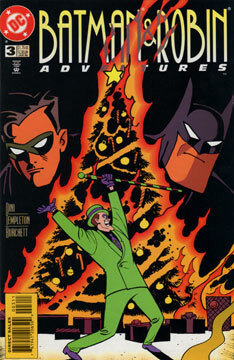 Riddler spends most of the story in a partial Santa suit. The red and white jacket over his black shirt and purple tie is fun. And Quiz and Query run around in “Santa’s helper” outfits with guns. Yes, it’s a Riddler story worth reading.